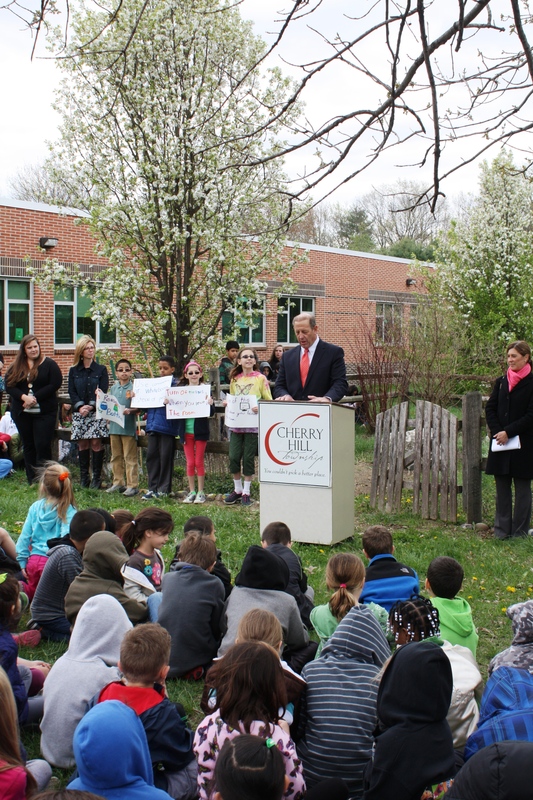 Mayor Chuck Cahn joined officials from Woodcrest Elementary School, the Cherry Hill School District, Sustainable Cherry Hill and Recyclebank on Wednesday afternoon to present the Woodcrest Elementary Green Team with a $2,914 Green Schools grant. The grant, provided through Recyclebank’s Green Schools program, will help enhance the school’s Peaceful Garden and Learning Center, an outdoor classroom where students receive engaging and interactive lessons on the importance of environmental preservation and sustainability, including nature, geography and nutrition. Lessons will be tailored to different grade levels within the school, so that all students can utilize the space. For example, students will learn about seeds, germination and factors that promote plant growth before they planting in their garden beds. Maintaining and observing the garden will give students a firsthand look at the life cycles of organisms, plant families, insects and characteristics of ecosystems. Specifically, the funds will help purchase gardening tools and supplies, new raised gardening beds, plants and horticulture and picnic tables. The grant was presented to Woodcrest Principal Dr. Beth Anne Kob and members of the school’s Green Team – a group comprising teachers, parents and a handful of fourth- and fifth-grade students who will serve as leaders in the school’s environmental education efforts. The Green Schools program supports environmental education projects in K-12 schools by allowing schools to earn up to $2,500 for Recyclebank Points donated by members of that school’s community. In Woodcrest’s case, more than 160 Cherry Hill households donated their points to the project, helping the school to fully reach its goal of $2,414. That was matched by a $500 donation from Domtar, a sponsor of the Green Schools program, bringing the total award amount to $2,914. For more information on the Recyclebank Green Schools program, visit https://www.recyclebank.com/about-us/green-schools. For more information on Woodcrest Elementary’s Peaceful Garden Project, visit https://www.recyclebank.com/contest/index/school/id/105/.